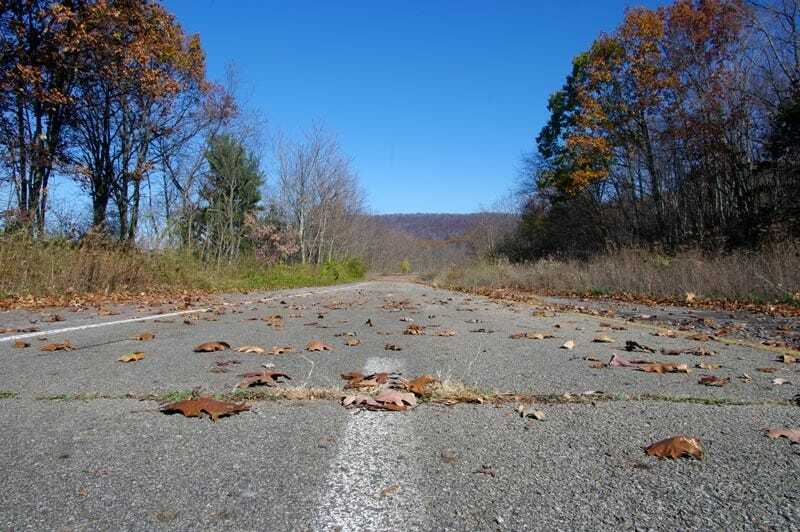 In the mountains of western Pennsylvania lies a stretch of abandoned highway, formerly part of the Pennsylvania Turnpike. It's a scene right out of a post-apocalyptic film, and it's open to the public. You can visit anytime you want. It's officially a bike trail though it's not patrolled or maintained. The Pennsylvania Turnpike was opened in 1940 amid much fanfare, carrying drivers at high speed initially between Irwin and Carlisle, soon expanding to connect Pittsburgh and Philadelphia, eventually crossing the entire state. Passing through Pennsylvania's mountainous terrain required the construction of seven tunnels, with the highway narrowing to only two lanes at each tunnel. Massive traffic backups at the approaches to the tunnels occurred almost immediately, and by the 1950's traffic jams stretching onward for miles were common. The Turnpike's engineers began examining solutions for alleviating these bottlenecks and drafted a plan to bypass three tunnels and bore "twins" for the other four. The Laurel Hill Tunnel was the first one to be abandoned, its bypass opening in 1964. This tunnel is now privately owned and used for aerodynamic testing of race cars. In 1968 the second bypass opened, leaving the Rays Hill and Sideling Hill tunnels abandoned along with a 13 mile stretch of roadway. The tunnels and roadway saw various uses through the years, including emissions testing, highway worker training, equipment testing, and even use as a police shooting range. Little upkeep was done to the tunnels and they were heavily vandalized. In 2001 the site was sold to the Southern Alleghenies Conservancy, who blocked vehicular access to the road and designated it a public trail. Due to the length of the trail it's best to bring a bike if you'd like to see the entire thing. If you're just interested in an afternoon hike, it's very easy to visit both of the tunnels. Access to Rays Hill is located just a couple minutes' drive from the Breezewood exit of the modern Turnpike. There's a small gravel parking lot at the trailhead and a short walk up a hill to access the highway. A country road passes under the highway. There's an amazing sense of desolation once you reach the road. You're in the middle of nowhere, surrounded by trees and standing on a seemingly endless strip of broken concrete. A few lines remain here and there but for the most part it's just empty and gray. Walking down the road is eerily quiet, with just the rustling of the trees and chirping of birds. It's hard to imagine this was a bustling superhighway a few decades ago. After about two miles you'll reach the Rays Hill Tunnel. It was the shortest of the Turnpike tunnels at only 2,532 feet. It's unique in that it only has one ventilation room (at the western portal) and is so short that the light from the other end is visible for the entire length of the tunnel. Walking into the portal, it almost feels like you're being swallowed up in the mouth of a giant beast. It's dark and very cold- despite 80 degree temperatures on the day I visited I could see my breath inside the tunnel. To the left of the portal is the door leading to the ventilation room. I didn't bother trying to get in as the stairs leading up to the equipment are completely rusted out. Due to its short length the interior of the Rays Hill Tunnel never becomes truly pitch black, and your eyes adjust to the light levels fairly quickly. We walked all the way through and checked out the other side, then headed back through it again and walked back to our car. Visiting the Sideling Hill Tunnel is even easier as there's parking about a mile from the tunnel. There's a small access road leading from Pump Station Road to the trail. Once there you'll pass through the former site of the Cove Valley Service Plaza, now just an empty lot. This site was used as a shooting range by police in the 1970's and 1980's and warning signs are still present. The new alignment of the Turnpike passes over the old Sideling Hill Tunnel, and the hum of traffic told us we were getting near. A blast of cold air greeted us at the tunnel's portal. Sideling Hill was the longest of the Turnpike's tunnels at 6,782 feet. It's very dark and very cold, and as you approach the center of the tunnel the light fades to an inky blackness. The other end of the tunnel is not visible until you pass about halfway through. Being deep inside a dark tunnel like this is a unique experience. I've never experienced claustrophobia before but after spending a couple minutes in here I started feeling very unsettled. It just feels unnatural, like mere humans aren't supposed to be there. Like the Rays Hill Tunnel, Sideling Hill has access doors leading up to the ventilation rooms, and this tunnel featured them on both ends. I also did not attempt to visit these as the stairwells were similarly rotted out like those at Rays Hill. There was a trail leading up to the top of the portal though, and I was able to peek inside and see the giant pumps that once moved toxic exhaust fumes out of the tunnel. I'd love to explore this room further and maybe on a subsequent trip I'll find a way in. Worth noting is the Sideling Hill Tunnel was used as a location in the 2008 post-apocalyptic film The Road, starring Viggo Mortenson. Besides the obvious creepy nature of the location, one of the reasons the film's creators chose this spot is because western Pennsylvania looks like a dead post-disaster wasteland in the winter, a fact I'm reminded of every time I look out my window. It was also featured in a Bloodhound Gang music video, with a little bit of added shrubbery. If you live near Pennsylvania or are just passing through I highly suggest checking this place out. It's an amazing piece of history and a truly unique experience. Set a day aside and bike the entire road. It'll be an adventure you'll never forget.